Columbus, NM is celebrating the centennial of Pancho VILLA's Raid(9Mar1916), on 12Mar. And, I just have to be there! But, I needed to upgrade my web gear. My original gear, was frankly tired & frayed. WPG, provided exactly what I needed! The M1903 Suspenders, M1909 Cartridge Belt and M1912 Bandoleer was PERFECT. More important, Jerry LEE was FAST! Ordered on 10Feb., received it 17Feb! No lie! This is a superb piece of workmanship. I had a hard time deciding if I needed the M1912 Bandolier or the M1910 Bandolier. I then noticed that the M1912 is Pea Green Olive Drab while the M1910 is Khaki Olive Drab. The former was used in Mexico and France, the latter was used in the Phillipines. Thanks Jerry, for giving me the right choice. 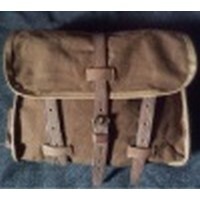 I have an M1903 Mills Cartridge Belt, that should give me adequate ammunition for the Moros attack. I sure am glad that we ditched those .30-40 Krags! A very well made and high quality reproduction of a rare piece.